Why is Judaism so intolerant of idolatry? I don't mean massive temples with human sacrifices. What about a civilized idolater, in the privacy of his own home. With a job, a family, a mortgage, donates to the World Hunger Fund and Greenpeace — and instead of one G‑d, he just happens to have two or three or even several dozen, all lined up on the dashboard of his car. Why does Judaism make a cardinal sin of it, demanding total eradication of idolatry in every corner the world? As long as it doesn't hurt anyone else, what's so terrible? There are many ways to answer this, but let's take a historical perspective. Historians agree that our current standard of ethics stems from the Jewish ethic. Yes, the Greeks gave us the natural sciences, philosophy and art; the Romans gave us governmental structure and engineering; from the Persians we have poetry and astronomy; from the Chinese, paper, printing, gunpowder, acupuncture and more philosophy, and so on. But the historical fact is that all those cultures (and all the other unmentioned cultures) sustained and even glorified attitudes and behaviors that today we universally find abhorrent. Today, if you dispose of your unwanted infants, practice pederasty, set humans to kill each other for sport, ignore the rights of those lower than you on the social ladder and refuse to acknowledge any social responsibility to the poor and the unhealthy, and can't wait to run to war against the nation next door, you are a barbarian. You may have made a wonderful citizen of Athens or Rome, but today, no club will take you. Where did those values come from? There's only one source historians can point to: Torah. And the same for universal education and the ideal of world peace. Now, this gives any scholar a meaty problem to solve. History is generally seen as something of a wild and diverse forest, where one thing grows from another. Seeds fall and sprout. Trees branch out and flourish, then fall and nurture mushrooms off their rotting wood. All the vegetation and creatures of the forest share the same air, water and soil and no creature exists alone. So, too, one civilization arises out of the mud, branches out, and falls to become the breeding ground of the next. Ideas move about, in perpetual metamorphosis as they pass through the filters of variant cultures. Whatever is, was — and will eventually pass. All except for the Jews. Entirely out of context, with an ethic that had every nation calling them crazy and absurd, ever-radical, always out of step. Definitely not part of this forest. And in the end, their ethic wins. There's got to be some explanation. First of all, where did they get these weird ideas? And telling me that the Almighty G‑d snatched them out of slavery and dictated it all to them doesn't work. It's true, but it's not enough. Because human beings can only hear that which they know already. There had to be something there from before. The classic answer is that once there was a man named Abraham, from Ur of the Chaldees — the original seat of civilization. He came up with this standard through his own maverick genius. Of course, being ingenious, brave and dissident wasn't enough. His task also demanded the tenacity and conviction to raise up a generation that would carry on this idea, swimming upstream against all odds of the dominant society. And then, over many ages, this ethic proved itself as the most effective backbone of a sustainable society. Now, tell me, does any rational scholar really believe such a scenario? The ethic that Abraham presented to the world had been there from the beginning. Humankind had originally known that each person bore the Divine image. That life was with purpose. That the world was the work of a supernal entity that desired we take care of it and judged us accordingly. Even in Abraham's time, there endured lone individuals who preached this to their disciples, as a tradition from Adam, through Methuselah and Noah. But we're talking about human beings. Precisely due to that Divine spark within, the human is also the wild and crazy creature that seeks out the most bizarre approach to life, ready and capable to do anything. So, human society in general abandoned the original standard of Adam for "that which feels good." Law became no more than a way for a king to govern his people. Ethics became no more than the custom that felt most comfortable to the most people. The only measure of the value of a human life was the degree of power a human held. And the natural world was understood as a worthless place, not worth any investment beyond that which produced food and power over others. Abraham didn't have to begin from scratch with humanity. He only had to rescue that original ethic. But he also re-discovered — and this he did do on his own — the base that made that ethic sustainable: Monotheism. More specifically: monotheistic providence. Simply put: Every adult and child must know there is a single Creator of all things, who cares about what you are doing with His world. Abraham's predecessors had also known of the one G‑d, creator of heaven and earth. But they understood G‑d as far too sublime and transcendent to be occupied with this mundane world and its creatures. They began to chip away at His providence, asserting that lesser powers, of His appointment, had been granted a share of dominion. They went so far as to build temples where they focused their minds upon the dynamics of these forces, attaining spiritual heights and mystic power. Eventually, wisdom gave way to charlatanism, as priests told the masses that a certain star or god or goddess had spoken to them, commanding them to serve him or her in a certain fashion. Rulers found that a good mix of secret knowledge and convenient mythology could be an instrument of power over the populace; that by controlling the flow of knowledge they were able to hold the people in awe and obedience. This is where Abraham dissented. He saw through the established order with its hierarchy of knowledge and power, and reasoned it to be the source of all evil. And he saw to the root of it: As long as G‑d was "up there" and everything else was seen as lying on a descending plane further and further removed from His domain, this evil would continue. Within such a paradigm, human life loses its essential value. You as an individual no longer count. All that matters is how high you are up on the scale. Not only human rights, but also the advance of technology is hindered — by the need of the ruling class to keep the masses working. All progress is to further empower the powerful. Public health, welfare and education are absurdities. So Abraham challenged that hierarchy. He taught each person to call upon the name of the One G‑d of the heavens and the earth, who judges the deeds of all men equally, from the highest king to the most lowly serf. By putting the original G‑d back into the world, Abraham recreated the "person" — a human who is of value just by being there. Within the old paradigm, ethics have no base to stand on. If you don't like what one god demands of you, you go find another god more to your taste. Or you work around these gods, tricking or bribing them, as they themselves are wont to do with one another. After all, none of them is supreme, none is all-powerful. Therefore, anything could be justified. 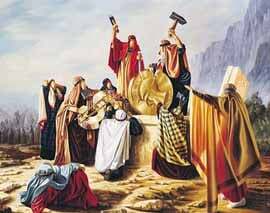 So Abraham smashed the idols. Once there is only one G‑d, who supervises all things, morality is no longer relative. All ethics are determined not by the flux of social convenience, but by His intransient standard. Without Abraham's base to ethics, society has no stability. Any institution could be shaken to the ground by changing circumstance and the whims of human desire. In Ancient Greece, the institution of marriage bordered on collapse due to their gender-preference, while in Rome, the family unit was gradually dismantled by promiscuity. The institutions that should have nurtured human spirituality in many societies became corrupted into bloody orgies and worship of the senses. In many instances, such as in the Far East, poverty was allowed to grow to unmanageable proportions while a select few amassed an immense concentration of power—all due to the void of a sense of social responsibility. In our day and age, with the origin of species attributed to the mystical gods of chance and natural law, the most horrid crimes against humanity were committed and the very biosphere is now threatened. Only once the building blocks of society stand upon the solid ground of the One Who Created Everything in the First Place, can a sustainable society develop. Truth be told, Abraham's message also began to perish with time. It wasn't until monotheistic providence transcended the realm of ideas and became the real-life experience of a people that it was truly able to stick. And that is just what happened at Mount Sinai, when Abraham's descendants came face-to-face with marching orders directly from Above. The concept of a "mitzvah" entered the world — something you do because G‑d wants it done. And that basis has proven eternally resilient. As for the rest of the nations, as the Rambam writes, they were also commanded at Mount Sinai — to keep the seven mitzvahs of Adam and Noah, which include the prohibition against polytheism. Today, we are witnessing the most dramatic results of Abraham's strategy in action: Our progress in the last 500 years, to the point of the current empowerment of the consumer with technology and information, only became possible through the rise of this ethic. In a polytheistic world, this could never have occurred. It was only once the people of Europe began actually reading the Bible and discussing what it had to say to them, that the concepts of human rights, social responsibility, the value of life, and eventually the ideal of world peace took a front seat in civilization's progress. And it is only such a world that could have developed public education and health care, old age pension, telephones, fax machines, personal computers, the Internet, environmental design and nuclear disarmament. We are too much a part of the flow to recognize this; the blanket of darkness that endures, fighting to its last breath, preoccupies our minds. But if we could travel back in time and describe to the Jew of past ages the world we have today — a world that values life, world peace, individual rights, freedom of expression, literacy, knowledge and compassion for those who have less — that Jew would undoubtedly respond, wide-eyed, "You mean, it is the days of Moshiach?" Further Reading: The Jewish version of history is scattered throughout the Talmud, but the comprehensive overview is in the opening of Maimonides' Laws of Idolatry. This is essential reading. So is the Lubavitcher Rebbe's talk that illuminates that overview, presented in Likutei Sichot, volume 20, pp 13-24. Most of this essay is based on those two sources. For an enlightening account of the Jewish impact on history, three popular books are: Rabbi Dr. Jonathan Sacks' A Letter in the Scroll, Paul Johnson's A History of the Jews, and Thomas Cahill's The Gifts of the Jews. An engaging audio tape on the topic is Ken Spiro's World Perfect. Is Monotheism Hazardous to Life? If G-d Knows Best, What's the Point of Prayer? Auto-derision behind commandment What is even worst than idol worship is the belief that G_d favors one people only. What is even worst than idol worship is the failure to acknowledge one's own idol worship. What is even worst than idol worship is the pointing of fingers in the direction of others. What is even worst than idol worship is the absolute impossibility for humanity to ever apply this commandment. What is even worst than idol worship is the idolatry of the book. I am reading this article to understand idol worship. It is all so thought provoking, the article itself and all the comments. Yasher Koach! "But if we could travel back in time and describe to the Jew of past ages the world we have today -- a world that values life, world peace, individual rights, freedom of expression, literacy, knowledge and compassion for those who have less -- that Jew would undoubtedly respond, wide-eyed, "You mean, it is the days of Moshiach?" Wtf? are you on another planet? seriously? We live in a world in which most are distracted by idolatry in the form of movie stars or rock stars or political figures while under a stealthy WW3, Palestine, Ukraine, Syria, Libya, Iraq and many others suffering, the TV lies to people and brainwashes them and as most idols have the same brainwashing everyone remains under the same spell of deceit. Your freedoms slowly evaporating with each false flag event, Central Banking increasing inequality, Military Complex creating new enemies to justify its ridiculous budget, Talmund law enacted in the West overriding Common Laws, etc.. The person who's praying, knows whether he's "praying to", or just using the medium. It may not be so obvious to the outsiders. For example, when we want to have a mental conversation with a relative who's far away - we may look at the photo to assist in our concentration. Are we "talking to a photograph", substituting it for the real person? Idolatry vs. using tangible objects for worship The real question is not whether there are many independent gods to serve. The question is why using something tangible during worship is prohibited. For example, we do not worship the Wailing Wall - but it appears that praying there and having those stones in front of you somehow improves the quality of your devotion. Similarly, Hindus use images and statues to help the worshipper focus his mind and his emotions. Yes it is possible to mis-identify such an image and literally "make an idol" of it, but its purpose is to be an object of concentration, not a "god's appointee". In our days, we have many non-physical idols in our communities. Some would say that the treatment that Torah scroll gets is a sign of idolization. Some might say that the current obsession with mitzvot indicates idolization of them. said, "please kill me instead"
Love From my experience, the only thing direct and always true and beyond my control or power to create is love. This is the only one true thing I can count on as real and valid and beyond habit or custom or something learned through ignorance training or wisdom. God must therefore be the source and origin of love. And if I allow this love to organize and direct my life I account that as following God's guidance. As far as I can tell, idolatry always tries to interrupt this guidance from God. It tries to supplant the love that guides us and offers to us an assortment of replacements. I cherish my heart and the love that creates me. Monotheism and Torah Monotheism becomes necessary when God opens the doors of hell and allows evil to function on earth along with everyone else. The Torah specifically addresses the awareness of the presence of evil in men's lives, the evil inclination. And the protection against this evil inclination, which often poses as a god or many gods, is monotheism and Torah. We are all idol worshippers to different degrees Not many of us, I suspect, have a carved wooden idol from some tropical country that we worship. No. However, idols (if I may use that language for convenience sake) are prevalent here, but they are invisible and usually comprised of things that many people view as good things. Idols might be our good reputation, wealth, charity, unique ability at work, or skill in sports. They could be our knowledge of information about history, science, sports, or anything else. It could be the good grades we received while in school, our current or prior great looks or popularity, or our life experiences, fame, hunting ability, the car or cars that we own, our house, our job, our beautiful spouse or stellar kids, our connection to someone else (maybe someone famous), our good memory, or intelligence (a word I had a hard time spelling and found using a spellchecker). Our idols are good things that become overly magnified. They, thereby, cause us to make poor decisions at critical moments or unbalance our life and possibly send us in the wrong direction. They can weigh us down with burdens we are not meant to carry or distract us from things that we should do. Somewhere, someplace, a line between positive “drive” and “idolatry” is crossed, and the results can have major implications. So how is this relevant to you? I guess what I’d like you to consider, if you would, is whether there are things in your life that are unbalanced, which could impact your decision-making process now or at key points in the future. Is there something that you have or are that you would improperly protect? Is there something that you would overly resist letting go of, which would therefore place you in inappropriate risk or cause you to do something that you shouldn’t? Are your relationships or decision-making process being hurt because of something that improperly controls you? Idols put us in a prison of our own making. Let’s take it a step deeper. Idols are actually multi-tiered. The ones identified above, including wealth, cars, sports, appearance, and so forth are considered by some to be “surface idols”, but there’s always something sinister hiding underneath. This thing is called the other side, and a mirror image of all that is holy. The question arises of why anyone has idols in the first place. I think the answer is partially found in what the idols do. They are essentially tools of self-justification. Deep inside of me, and I think others, is a competitive desire to justify myself– to prove myself worthy, of value, and possibly better than others. So why do I have this need? I think it is because deep, deep inside, I know that I need to prove myself. Why? Because I am lacking and because I have need of justification. That’s where G-d comes in. He says that you are correct; you don’t measure up. In fact, you are infinitely far from Him. Like a single blade of grass in a field of grasses turning to the blade next to it and correctly saying, “I’m closer to the Sun than you”, we also compare ourselves to our peers using yardsticks (our idols) of our own making. As each blade of grass is infinitely far from the sun, we also are infinitely far from God and God’s standard of holy perfection. Where else? Jack in SC: It starts with you. And it kindles the fire in each of our hearts and minds. And it catches on in this way until the whole world burns with a desire for what is good and right and decent. Our God is an all consuming fire. It's up to each one of us to be the spark that starts the fire and fills the world with hope.